Trading the The Unlimited Forex Wealth indicator is designed to automatically identify the trading setups described at the strategy guide. It automatically identifies strong trends, filters out range periods, identify local highs and lows, and alerts you when price retraces to a local high\low so you can enter a trade. However, it is important to note that despite its accuracy no indicator can replace a human being, and it is needed to confirm the signals manually before entering them, to make sure they fit the entry criteria. A human can also identify trades that the indicator would miss, due to its mechanical nature. Interpreting the Messages of the indicator . 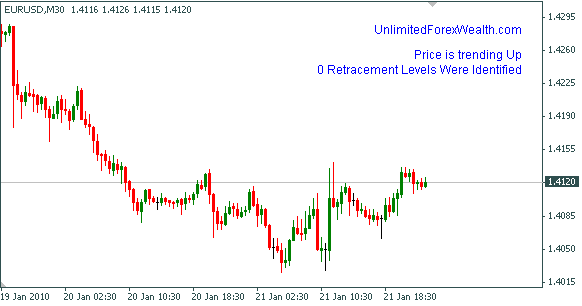 The indicator also identifies trends and ranges, and will write whether the pair is trending up, down or in a range (flat trend with no momentum). If the pair is in range it is recommended not to take any trades. Identifying Retracement Levels The indicator automatically identifies levels which price has broken, which we will enter when price re-tests them. These levels are marked on the chart by a horizontal, dotted line. When price retraces to such level, you will see a message on the screen. For example: 'Price is re-testing a local high, prepare for Long trade'. A sound alert will also be issued, to alert the user that a signal is taking place. In the pictures below UltimateForexWealthIndicator trading guidein action. Share your opinion, can help everyone to understand the UltimateForexWealthIndicator trading guide. Trading the The Unlimited Forex Wealth indicator is designed to automatically identify the trading setups described at the strategy guide.